Happy Thursday, friends! This week is flying by... what are your weekend plans? I don't have too much going on this weekend, but every other weekend in March and most of April is PACKED. We have a few quick trips planned and my baby showers coming up. I'm looking forward to an eventful spring (and praying for stamina LOL)! Today's look is the perfect early spring outfit. 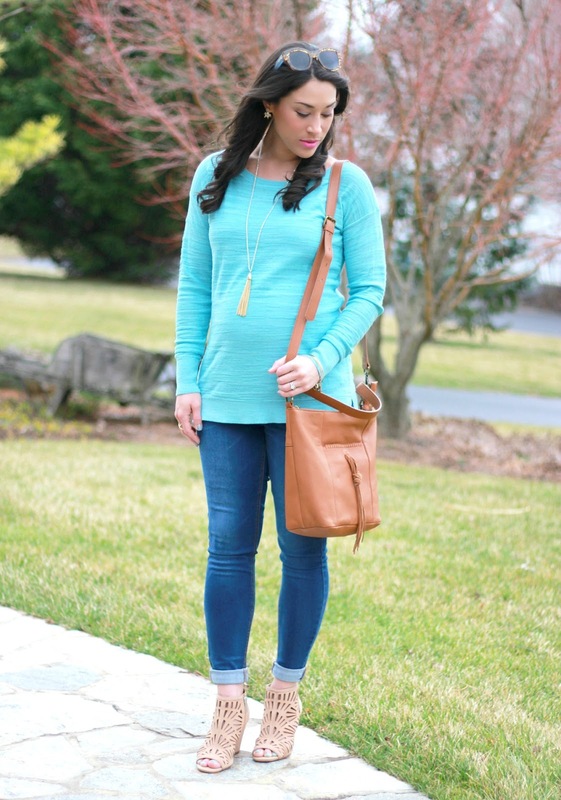 I love lightweight sweaters and open toe booties for transitioning into spring! 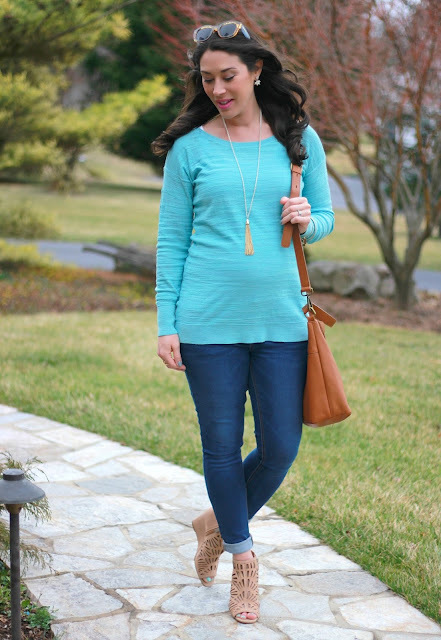 This LOFT textured tunic sweater (non maternity) is light and soft and aqua is such a gorgeous color for this time of year. It's available in all sizes and also comes in a bright red color...plus, it's 40% off today with code NEWNOW! As I shared in a recent post, perforated shoes, especially booties, are a huge trend this year! These perforated BCBGeneration peep toe wedge booties are so cute and comfy. They are a chic spring shoe and can definitely be worn into summer, too! They are available in most sizes here. 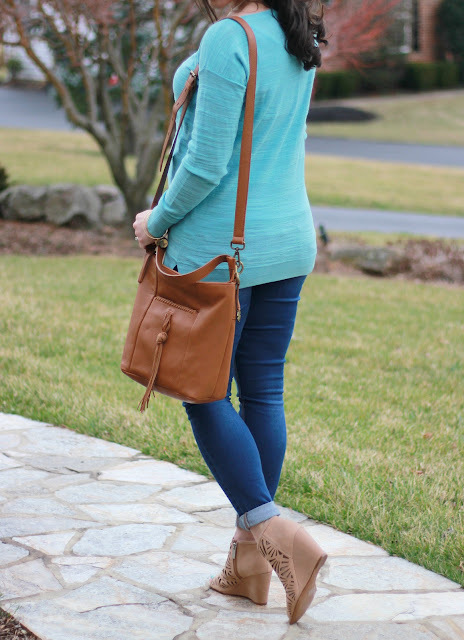 I recently bought this Lucky Brand bucket bag at Nordstrom Rack and it's my new favorite! It's on sale for $65.80 (65% off the original price), which is a great buy for genuine leather. I love the casual vibe of this bag and the long crossbody strap. 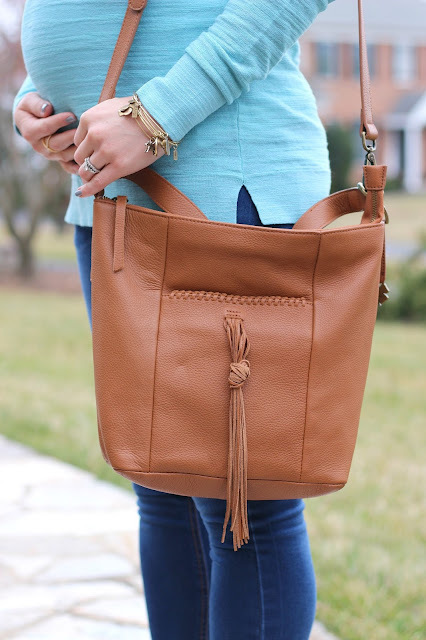 The tassel detail is really cute, too! Also, it comes in a bunch of other colors to choose from (mine is tobacco). To add interest to my tunic sweater, I wore a long beaded tassel necklace from LOFT (similar here). I added my favorite ear jackets from Stella & Dot. I always get so many compliments on these stylish earrings! The small earring size is perfect with a statement necklace like this. Can I just say that turquoise color on you is STUNNING!? And I am obsessing over those wedge booties...SO cute!!! What color is on your toes? Love that color! Hi! The polish is Spoiled by Wet n Wild and the color is Mar-zi-panna. I love that color sweater with your bright lipstick! And the cutouts on your booties give them a little somethin' something'. Thanks for linking up with Fabulous Friday!